WhiteCloud Software Ltd. announced the release of version 4.3.0 of EAComposer. An innovative and simple-to-use enterprise architecture tool used it to manage your IT landscape and technology portfolio. Delivered as a pure SaaS product: cloud hosted with a subscription based license model. This release wraps up the 2017 year and brings the total to 8 major releases and 12+ minor releases! 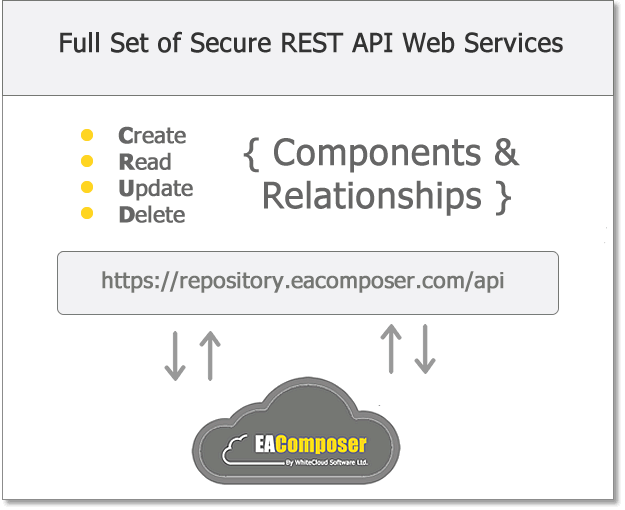 Release 4.3 added a series of REST based web services enabling you to programmatically interact with the EAComposer repository. Fully secured using OAuth2 authorization and industry standard AES256 encryption. - Manage Components and Relationships using Web Services: With the REST based web services you can now read, add, remove, update components and relationships from/to your repository. This is often desirable when you have other systems maintaining some of the data from your portfolio and want to avoid manual steps to keep these two in sync. The most common use case scenario for this is when you have a CMDB maintaining the configuration behind applications but want to incorporate the configuration items inside EAComposer to be able to leverage the EAComposer impact analysis and traceability reporting. Of course there are many other use cases when you would like to setup such automated integration and our platform has a clean set of web services to support any of the requirements. - OAut2 Authorization framework: EAComposer leverages the industry standard and fully secure OAuth2 authorization framework. Used by many others including Facebook, Twitter, Microsoft, Google and Amazon. - Standard JSON outputs: all REST web services return standard JSON data sets, efficient and flexible.